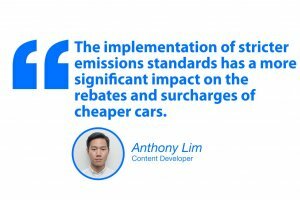 With the new Vehicular Emissions Scheme kicking in, here's a breakdown of how it affects the banding and pricing of some popular car models in Singapore. The story: With the new Vehicular Emissions Scheme (VES) kicking in on 1st January 2018, here's a list of popular car models and their respective bandings before and after the implementation of the VES. 1. The VES has replaced the outgoing Carbon Emissions-based Vehicle Scheme and will run for two years starting from 1st January 2018. 2. The new scheme will be reviewed again before it expires. 3. Under the VES, four more pollutants will be taken into consideration on top of carbon dioxide. 1. 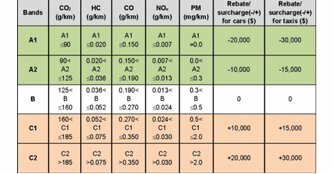 With the implementation of stricter vehicle emissions standards, some popular car models may see a significant change in their rebates or surcharges. 2. Whether you like it or not, the change in rebates and surcharges, as well as its effect on new car pricing, is here to stay for the next two years. Based on the popularity of these models and the fact that several of them are relatively new to the market, these are the groups of vehicle buyers that will be the most affected by the VES. Looking at these numbers, cars in the ~$100,000 price range are considerably more affected by the VES than those sitting higher up in the price range, as the effects of the new banding will disproportionately affect cheaper cars.